One more review for the year, shall we? I decided to see what all the fuss was about from all the other bloggers about this delightfully weird combination of comedy, agricultural science, and a little-explored setting for anime: the agricultural college! Many have spoken of how educational Moyashimon is: “now I don’t have to study for my biology exam!” and the like. I can sort of see why. 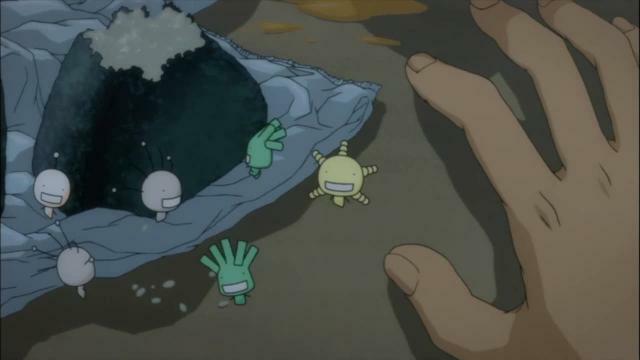 The microbes in this show are some of the most adorable and hilarious things I’ve seen since the Tachikomas in Ghost in the Shell Stand Alone Complex. Moreover, they have very memorable shapes and colors, and are always accompanied by their abbreviated scientific names–and they give little lessons on what they do at the end of the episodes! You’ll never forget how the brewing process works again. Instead of being in the Noitamina block where Honey and Clover and Hataraki Man once ruled, it should be on the educational segments of NHK. If anything it improves and raises the profile of a branch of science few people ever hear about. When we think of science we think of high tech, laboratory type environments, not going out and sweating on a field or, well, millions of adorable little germs floating all around the place with squeaky voices. In truth, of course, without agricultural science billions of people would be starving today, and life expectancies much shorter. 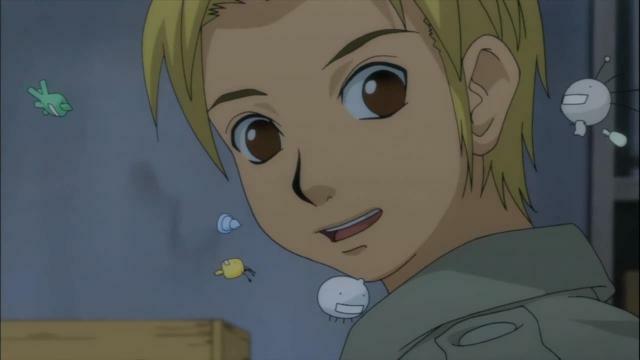 Could Moyashimon do for agricultural science what CSI did for forensics? Who knows, given how few people probably watch the Noitamina block, but it sure makes learning about germs a lot more fun. Of course it wouldn’t be any fun at all if it was only about learning your microbial names. 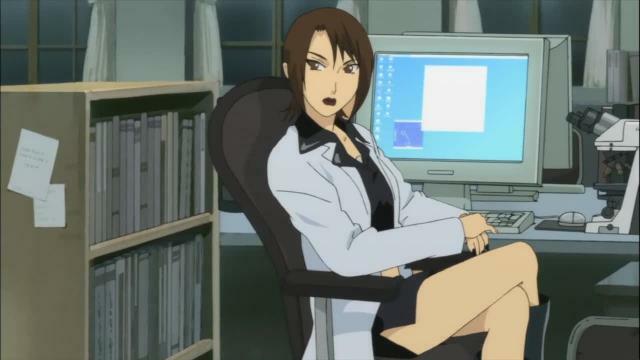 We have here a very funny bunch of characters stuck in an unlikely setting, especially (in my opinion) the researcher Keizo and his graduate assistant, Haruka (she’s hot…). Sawaki, who has the special power to see microbes with the unaided eye, is alternately their punching bag and their test subjects, much to my amusement. And they really got some of the details of college life right–the festering, messy rooms, the plot to manufacture alcohol (sake), the lack of money…stuff that H&C dealt with too, of course, but this combination is quite unique. 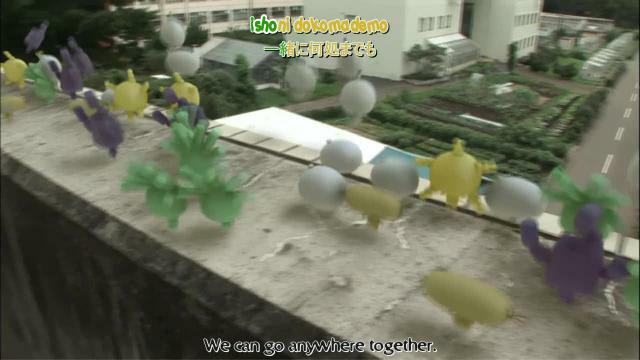 The OP definitely owes something to the OP of Honey and Clover, with its live action segments but with our favorite microbes dancing in apparent CGI or perhaps claymation. (I loved the lyrics about taking tests too.) I could tell this was a Noitamina show just from that, though my understanding is that this block is aimed primarily at the josei audience. Haruka is drawn in a very josei-style way, but the show on the hole doesn’t seem to be very gender-targeted in my view. Once again, I’ve come on to a comedy late, but this might join Minami-ke as one of those shows where it’s good to just relax and watch, all while learning about microbes in a very easygoing, charming way. If only they weren’t sometimes so harmful in real life…because as we all know, nothing this cute could possibly be bad for you! And that is my last post of 2007. Happy New Year, everyone! Hah? Why would I be interested in a bunch of stinky fungi? I eat enough mushrooms and I rather not deal with athlete’s foot. Cute? That’s all the more reason to fear them! Nothing cute is ever good for you… Take Enma Ai for example. Cute, but seeing her pretty much means you’re dead. And the puchus. The list goes on and on. One of those cute bacteria just might be the patriarch of a dynasty of human-infecting bird flu. There is also an epic trap running gag thing in the later episodes, if you’re into that kind of thing. This trap also wears goth loli AFAIK. Hint: It’s not Tadayasu.